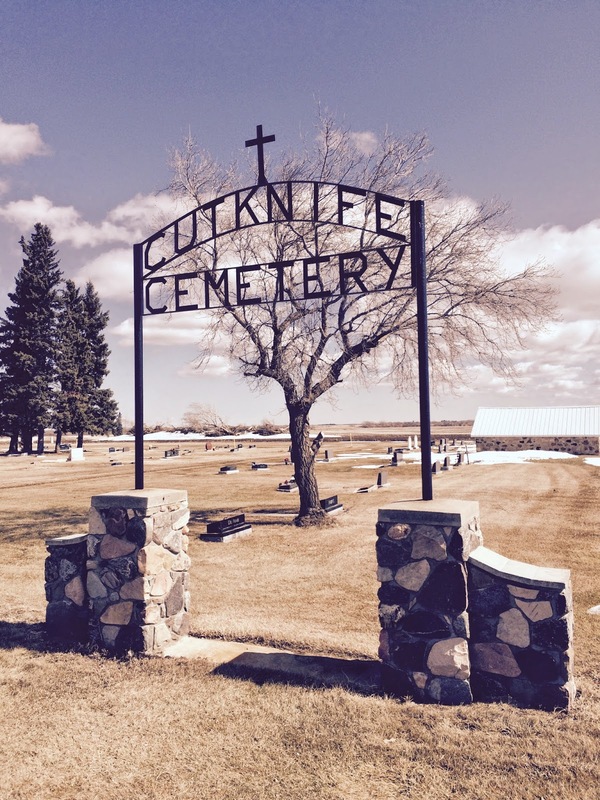 The Cut Knife Cemetery, like so many others in Saskatchewan, is over one hundred years old and, meandering through on a Sunday afternoon, it is easy to recognize the older graves. Lettering has eroded on many of the softer marble stones and names and dates on others have filled with mosses and lichens, both of which make the inscriptions difficult to read and the graves to identify. A few headstones have broken, a few plots have remained unmarked for reasons unknown. Perhaps, there are records that can fill in the gaps, perhaps not. Cemetery records everywhere, especially the older ones, are notorious for being lost, or damaged, or destroyed in fire and flood. This makes it especially difficult for families who are searching, at a distance, for an ancestor. A grave connects a person to a place and provides a context; a grave marker records vital statistics. Sometimes, a marker can also shed light on a personality through the choice of epitaph, the presence of religious or association symbols, nicknames, etc. When both records are no longer accessible, a vital piece of family history is lost. Many rural cemeteries are cared for by volunteers and are just not in a position, financially, to undertake large restoration projects. In addition, the volunteer hours required to clean, photograph and annotate a whole cemetery of headstones is probably not realistic, either. Maybe, a simpler approach would work . . . providing online accessibility to researchers. . . 24/7? CanadianHeadstones.com is a volunteer-driven, not-for-profit organization that archives photos and text of cemetery grave markers submitted by individuals or cemetery committees. The CMMM has listed it on our Family History | Canada page as a genealogy resource. The Cut Knife Cemetery and the Carruthers Cemetery are already represented online with a number of photos to view for each. The next time you're wandering through your local cemetery with your phone or digital camera, consider digitizing your family's headstones and sharing them online with those who may be searching for them. In all probability, if any part of the headstone is illegible, you or a family member would have the knowledge needed to record the correct information.